Taking care of birds year 'round! 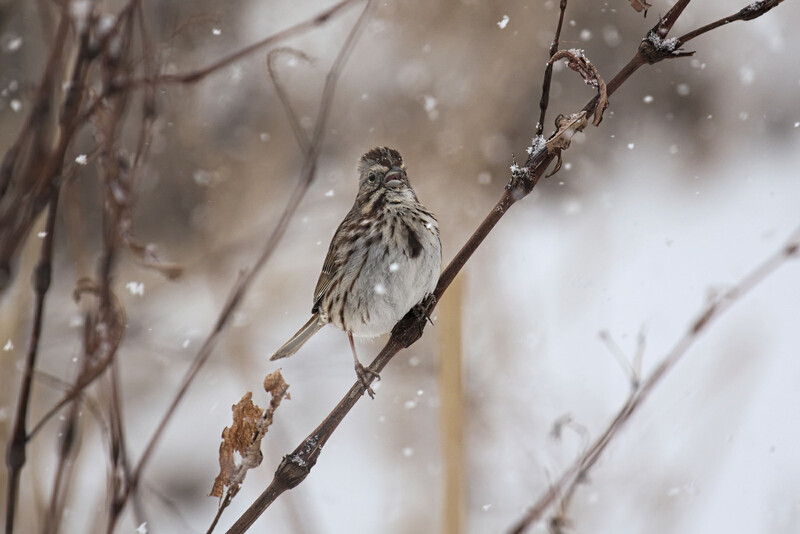 Put your winter garden to work as a haven for birds. Leaves and brush left to compost provide foraging and roosting places, smother this year’s weeds, and feed next spring’s plant growth. Watch for juncos and towhees in the leaf litter, and wrens in the brush. Maybe even a Song Sparrow, like this one! With a little planning, your garden can be a haven for birds year round. November, and time to put your garden to bed. But wait! You could put it to work as a haven for birds! Rake leaves back onto the flower and vegetable beds. [Raking] They’ll smother the weeds and decompose, to feed next year’s plant growth. In the meantime, juncos and birds like this towhee will scuffle and feed in the leaf litter. When you trim back the trees and shrubs, throw gleanings into a far corner of your yard. The pile will slump into nutritious garden compost over the winter, and the Song Sparrows and wrens will thank you for a place to forage and roost. 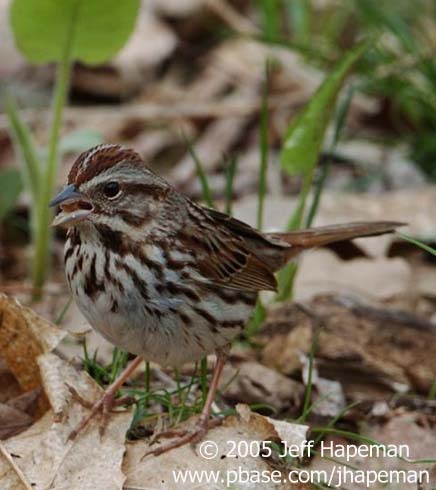 [Song Sparrow] Leave the seed-heads on perennial plants – they’re natural birdfeeders! – and they’ll feed finches, sparrows, and Pine Siskins. If you need to prune a tree – or even cut it down – this is the best time of year to do it, because you won’t be destroying the active nests of birds. And if you can leave a snag, so much the better for wildlife. With a little planning, your garden can be a haven for birds like this Bewick’s Wren, year round. Learn more about gardening for birds at our website, BirdNote.org. There's more about snags, too! I’m Mary McCann. Calls of the birds provided by The Macaulay Library of Natural Sounds at the Cornell Lab of Ornithology, Ithaca, New York. Song of Song Sparrow  recorded by G.A. Keller; Spotted Towhee feeding in leaf litter recorded by K. Colver, call of Bewick’s Wren and chatter of Pine Siskins  by G.A. Keller. Dead trees - or "snags" - attract wildlife! More at NWF.org. Video: Dark-eyed Junco enjoys lavender seeds! Locate a Master Gardener to help with your yard! Video: Pileated Woodpecker takes advantage of a snag!